Until relatively recently, little thought was given to stopping heat escaping upwards through the roofs of our homes. Often all that stood between the occupants and the elements was a lath and plaster ceiling and the roof covering itself. Even now, many roof spaces that have been thermally insulated have insufficient or poorly performing insulation that has slumped over time, or has been disturbed by electricians and other tradesmen. One of the most effective places to insulate a house is in the loft – in other words, insulating the roof. Follow our guide to find out how. Roof spaces take many forms and are used in different ways. They may simply be a void beneath the tiles or slates; others are used for storage or may be habitable rooms that include dormer windows. Each type of roof needs to be treated in a different way; incorporating insulation into an old roof and reducing air leakage from the rooms below relies on using appropriate methods and materials. Whatever system is used, ventilation is vital to ensure the necessary air movement to prevent condensation from water vapour, as this can lead to decay of the structural timbers. Before any work begins, the condition of the roof itself should be assessed and any leaks, damp problems or structural issues addressed. Adding insulation in lofts is generally a relatively straightforward and cost-effective job, with a quick payback for your efforts. These spaces are known as ‘cold’ roofs as the insulation is laid on top of the ceilings of the rooms below to prevent heat loss into the loft. Before laying new insulation it is worth clearing the space of debris and any old insulation material that is no longer serviceable. 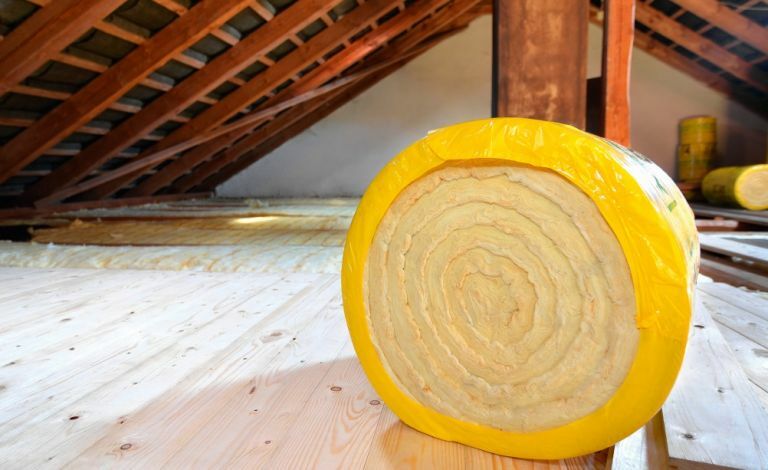 The most common way of insulating a loft is to lay quilts or batts of insulation material between and over the joists. Permeable insulation works well with old buildings that ‘breathe’. Suitable insulation includes natural fibre-based products made of sheep’s wool or hemp, as well as mineral wools. The other option is loose fill or blown insulation. This can take various forms but the most common are mineral wool or cellulose fibre produced from recycled newspaper. Loose fill has the advantage that it fills all the gaps but it can be blown around by air movement within very draughty lofts and so becomes uneven. Rigid insulation boards can be hard to cut exactly to fit into the gaps between joists so are generally not recommended, but if are used must fit tightly together. The thermal performance of insulation materials is described by thermal conductivity, the ‘K’ value. The lower the K, the better the product will hold in heat. Whatever is chosen should achieve a minimum U-value of 0.16 W/m²K. Maximising insulation properties or ‘U’ value of your building is crucial, but choosing natural alternatives lessens the environmental impact. Hemp quilts such as Isonat combine hemp and recycled cotton. Typical K value 0.039W/mK. Hemp is a great eco plant as it is fast-growing and locks up vast quantities of carbon dioxide. Sheep’s wool insulation provides a market for unwanted fleeces. Typical K value 0.038 W/mK. Wood-wool insulation is made almost entirely from waste wood products. It is stiffer than hemp quilt or sheep’s wool, making it more suitable for certain applications. Typical K value 0.038 W/mK. Recycled newspaper fibres such as Warmcel have a shorter lifespan than most insulation quilts but are much more economical and are often used in large loft spaces. Typical K value 0.035W/mK. To meet the desired ‘K’ figure will invariably require more than one layer of material and, with quilts or batts, it is best to lay the layers at 90 degrees to one another to minimise gaps. All pipes in the loft space must be insulated too. The layer of insulation should continue over water tanks but do not insulate directly underneath – warmth from the rooms below can help prevent freezing. Continue the insulation right to the edge of the ceilings but do not allow it to block the eaves’ ventilation. It is thermally efficient to lay the insulation in more than one layer, with any gaps between each packed with loose-fill cellulose fibre. Thoroughly clean out the roof space first, but ensure no damage occurs to the protruding ‘nibs’ that hold up old plaster ceilings below. The amount of insulation installed in the lofts of new buildings has steadily increased over the past half century, from about 25mm in the 1960s to 270mm today. Although the building regulations do not retrospectively apply to old buildings, it makes sense to consider topping up existing insulation to a greater thickness. Where existing insulation is in a poor condition (for example, it has lost its effectiveness where compressed) or badly fitted, complete replacement is normally advisable. Do watch out for wildlife: check the roof space for bats and nesting birds. When a protected species is present you will need to abide by the law and may have to modify how or when you undertake work. Do wear protection: wear a mask, gloves and protective clothing. Loft spaces are frequently dirty and some insulation materials are an irritant to the skin, eyes and respiratory tract. So steady yourself: take care when working in roof spaces. Always stand or kneel on the joists rather than the ceiling, as one wrong footing and you could fall through the roof. Don't pack it in: don’t squash insulation to fit the space as this seriously compromises its effectiveness. Also avoid pushing the insulation into the eaves, to keep ventilation paths at the edge of the roof well aired and roof timbers dry. Don't upset electrics: don’t lay insulation material over electrical cables because of the risk of overheating. Where this is impossible, ensure cables are in good condition and, if necessary, have them inspected by an electrician. Don't use the wrong materials: don’t use spray foam insulation on the underside of roofs. It can trap moisture around the timber, stops tiles or slates being reused in the future and prevents inspection of the underside of the roof. Converting the loft into a habitable space, as perhaps a home office, guest room or master suite, can add valuable space and desirability to a period home; but a more complex system of insulation is required where roof spaces are ‘warm’. There are a number of options as to where the insulation can be placed. The ideal time to install insulation is when re-roofing, as fitting insulation above the rafters is the best technical solution. The downside of above rafter insulation is that it raises the height of the roof and may have aesthetic consequences. Where above rafter insulation is not possible, the alternative is to insulate between or below the rafters, or a combination of both. A key consideration is headroom, as insulation added below the rafters naturally lowers ceiling heights. In older buildings, where attic space already existed, installing insulation is likely to mean the loss of historic plasterwork, which is not always appropriate, especially if the building is listed. Whatever form the insulation takes, it is vital that there is an air gap of at least 5cm between the face of the insulation and the roof covering. To avoid condensation problems, this space must be well ventilated so vents may need to be installed in the roof and at the eaves and ridge. Quilt, batt and board types of insulation, or a combination, can all be appropriate but boards need to be cut accurately so there are no spaces around the edges. Insulation on its own does not necessarily provide an airtight solution that will stop draughts and heat loss, so it is vital that all joints overlap or are taped. Anything that penetrates a ceiling results in air leakage, draughts and the passage of moisture into the space above. For these reasons, recessed downlights are particularly problematic and present the added difficulty that insulation must not be laid around or over them because of the risk of fire from overheating. One solution is to fit ‘fire hoods’ over downlights, which are widely available from electrical suppliers and are designed to help prevent the spread of fire and air leakage. Another is to replace bulbs with modern LEDs which don’t emit any significant heat and can be safely boxed and insulated on top. If humid indoor air finds its way through any gaps in insulated ceilings, it can condense on cold surfaces hidden behind, resulting in damp and timber decay. Condensation can also affect areas where the insulation is thin or missing altogether. Common ‘cold’ spots are found around windows and door openings and on the sloping edges of ceilings in bedrooms and bathrooms, which are prone to develop patches of black mould. To prevent this, the insulation must be continuous without any gaps. The most obvious way to minimise condensation, however, is to reduce the amount of moist air generated. Fit extractor fans in en-suite bathrooms in lofts, and improve controllable ventilation by fitting trickle vents to any windows, or simply opening the windows after showering or bathing. Expectations about domestic comfort have changed greatly over the centuries. Most surviving houses built between the mid-13th and early-17th centuries originally had a central ‘open hall’ that extended upwards the full height of the building. The hall was the hub of domestic life and heated by a fire on a chimneyless hearth in the middle of the floor – not dissimilar to a bonfire! The smoke escaped through louvres and gaps in the roof tiles or slates. Important changes in house design occurred in the 1500s as the open hall declined in popularity and a desire grew for rooms with better privacy and individual heating. During the ‘great rebuilding’ between 1550 and 1650, first floors were inserted across most open halls, and smoke hoods and masonry fireplaces added. Ceilings above first floors also became the norm after the medieval period and aided comfort. In fact, 16th-century records indicate that the word ‘ceiling’ is derived from the act of sealing a building from draughts. Old ceilings generally comprise lime, sand and hair (sometimes gauged with gypsum in high-status work) or are clay-based with a lime binder and skim. Backings often consist of riven (split) timber laths or, occasionally, bundles of reed fixed with laths. This type of plasterwork can be more pleasing in character, as well as offering better internal comfort and sound insulation than standard modern substitutes, such as plasterboard. Where loft floors above these type of ceilings lack good levels of thermal insulation, this is usually easy to address.